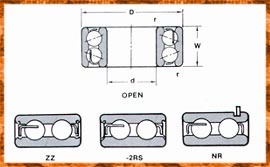 This series is manufactured with the same ID and OD as 6300 series. By utilizing double row construction, the 5300 series is used with heavy radial, combined radial and thrust or where are two directional loads. The non-filling slot allows these bearings to be used at high RPM. In addition, the angle of contact converges outside the bearing, offering increasd resistance to overturing moments. .